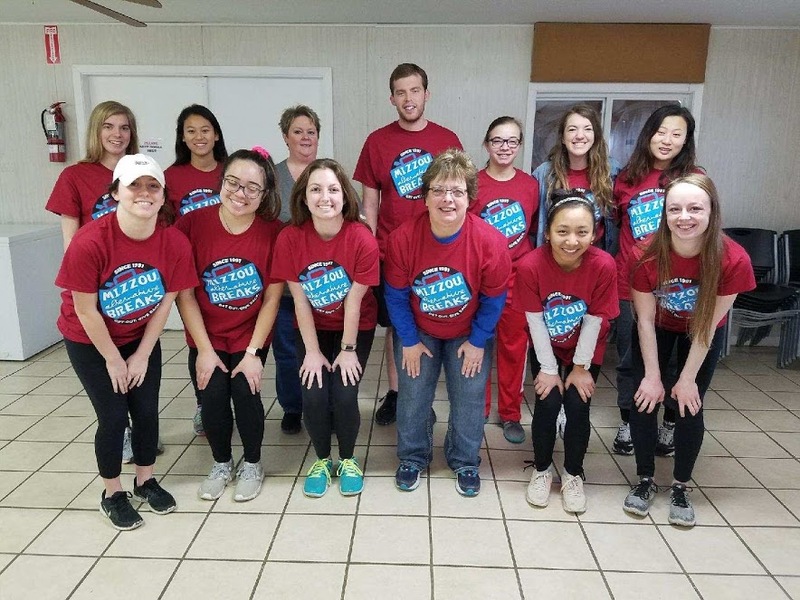 Our group of 10 was lucky enough to have the opportunity to stay at Kamp Keirsey in Amsterdam, MO for the weekend of March 9-11th. Upon arrival on Friday night, Bill Perkins, the Kamp manager, was kind enough to show us around and make us feel at home. Saturday morning was very chilly and we got up bright and early and headed to Frontier Village where Ruthann and Jerry Ferguson generously treated our whole group to breakfast. We enjoyed an all you can eat breakfast at their annual VFW fundraiser, put on by the women of the Tractor Association. We had eggs, pancakes, and biscuits and gravy for breakfast and were fortunate enough to be surrounded by locals and veterans who were also enjoying the fundraising breakfast. We were all divided into 3 separate groups for the majority of the day on Saturday and served at 5 different sites between the 3 groups. 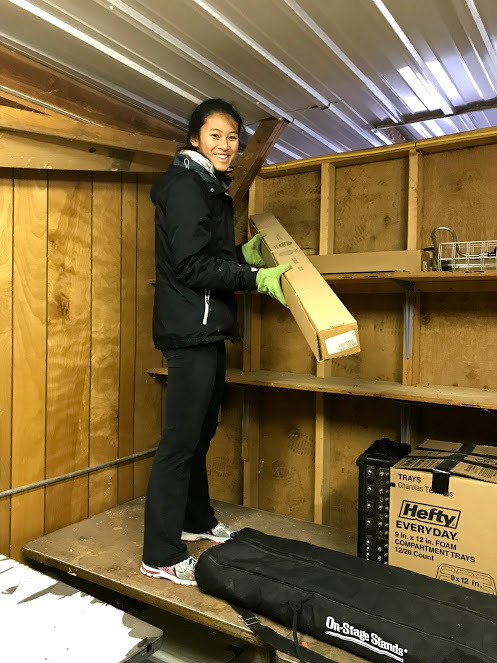 Yihua, Kate, and Chris spent a few hours doing service in Hume, MO. They met up with Melody, the woman responsible for setting up the town-wide clean up. 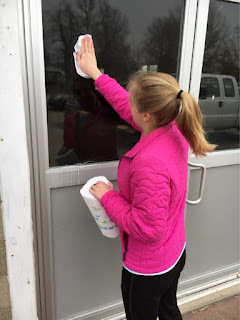 Their group began by washing windows in a building called Memorial. In this building they had display cases with trophies from various types of sports. While they were cleaning the windows, they were offered help by kids aged 11-13. The kids really had fun with the squirt bottles and enjoyed telling them about their friends and school activities. 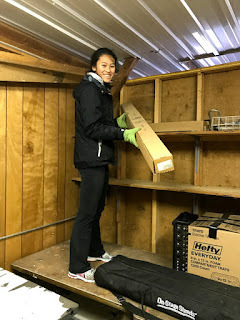 Once the windows were finished, Yihua, Katie, and Chris walked from one end of the town to the other picking up trash alongside the main road. 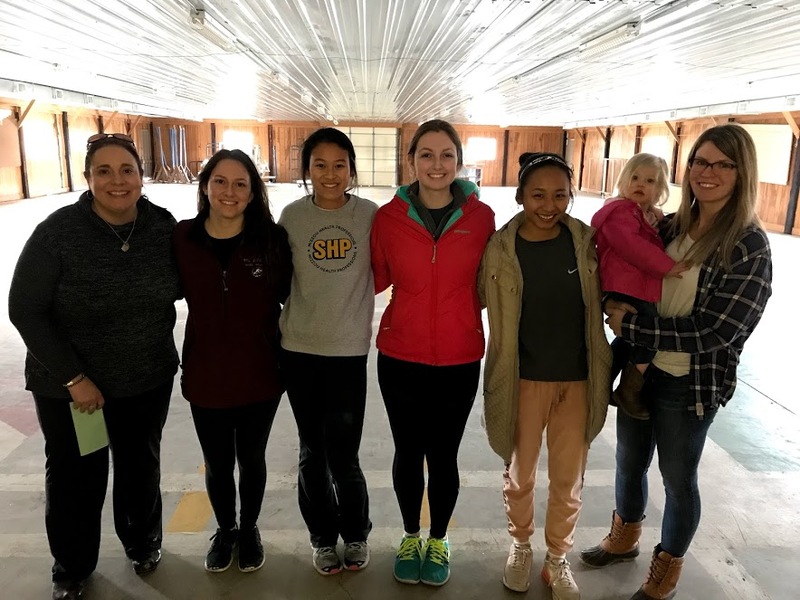 Our second group of 3, Ashlyn, Rachel, and Hope began their service by putting mulch down at a playground at a center for victims of domestic violence. 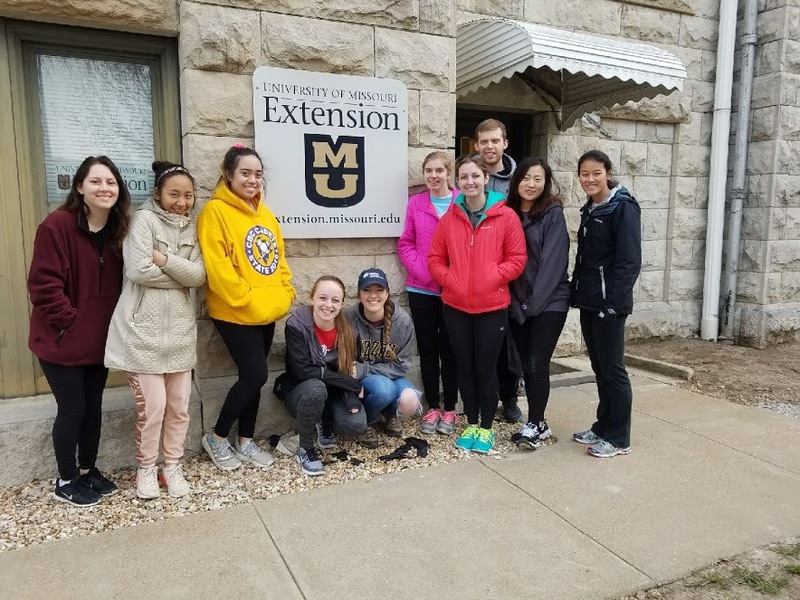 They worked alongside two local high school students in the A+ program named Addy and Jaden, as well as two community members, Tammy and Jerry. The playground was transformed into a welcoming place for children to play as they got to know their Bates County friends. From there, they walked down the block to the recycling center, where they sorted through recyclables and trash. While they worked, Jerry told tales of attending Mizzou in the late 60s. Once the trash was contained, they traveled across town back to Frontier Village, to the museum and community center. They cleaned the train track and burned leaves, sticks, and tree branches. THEN JERRY LET THEM RIDE THE TRAIN! After a few rides and some stories around the burn pile, they rejoined our team at the Fairgrounds. 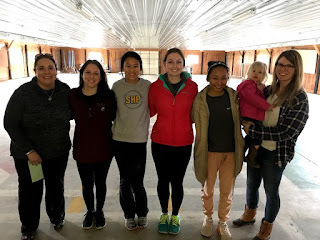 My group of 4, Emma, Hillary, Cassidy, and I (Emily), served at the Bates County Fairgrounds. We spent the day under the direction of Lee Taylor, the fair board secretary, and Brandy Ward, a board member. We began the day by cleaning out the main building and discarding trash into a dumpster. We then moved on to arranging and decorating tables for the county's fundraising mouse race that is being held on Friday evening to raise funds for the fair in July. Lastly, we counted 11,111 prize ribbons that will be awarded at the July fair. We loved our time working with Lee and Brandy, as well as Brandy's 2-year-old daughter Collins who kept us on our toes and smiling all day long. Upon completion of our Fairground tasks, we all drove to the Adrian soccer fields where we scraped and painted goal posts to prepare them for the upcoming soccer season. Our evening ended with us being invited to attend a fish fry hosted by the Bates County Mizzou Alumni. They made us fish, chips, coleslaw, and onion rings! We sat around a huge bonfire and introduced ourselves and connected with alumni while roasting marshmallows. We even made plans to reconnect with them at tailgates in the fall. This weekend would not have been made possible without the assistance of Robyn Eckhoff. Robyn went WAY above and beyond to find quality service for our students to complete, arranged food for us for every single meal, and found us wonderful housing nearby. We cannot thank her enough for all of the time she dedicated to ensuring we had the best time possible in Bates County and I can speak for everyone when I say that we had a wonderful weekend! 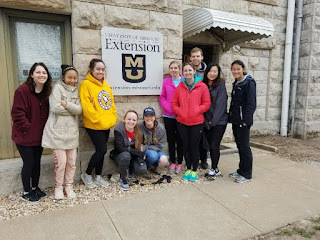 We would also like to thank Brenda Doody and Tammy Roberts for all of their assistance as well as everyone we worked with over the weekend. Our trip to Bates County will forever be a special part of our Mizzou experience.